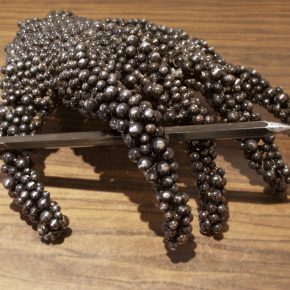 Sculptor Joe Norman returns to Utah this month with an exhibit of works at Park City’s Gallery MAR that marks a shift from practical to theoretical concerns. 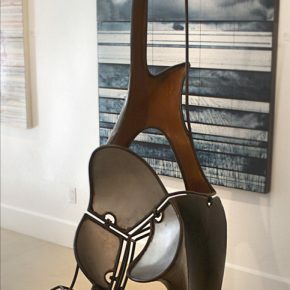 Norman first came to our attention in 2009, when he was selected for that year’s iteration of the 35×35exhibition, Artists of Utah’s showcase of the state’s young talent. 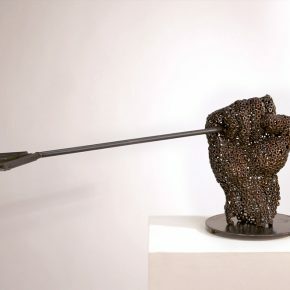 As Norman explained in a video interview we recorded at the time, he had studied engineering and taught science and math in secondary schools before deciding to devote himself full-time to becoming a sculptor. And a motorcycle mechanic. Both ventures fueled his enthusiasm for junkyards, where he would reclaim just about anything for his projects. Norman’s sculptures have always had a practical, and frequently a political, bent. Out of old boats, airplane parts and about anything he can find in the scrap yard, he creates furniture, especially tables, where people come together and create community. He has used the same materials to comment on the environment, war and other issues that fire up his spirit. In his most recent work, we see a shift toward more theoretical concerns. 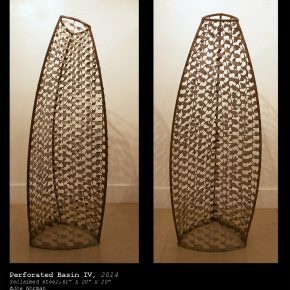 For instance, the pieces in his Perforated Basin Series are explorations of form, the nature of sculpture, and what it is about material, or its lack, that creates a surface. After completing a residency in the Great Basin of Nevada, Norman became interested in the work of Michael Heizer. 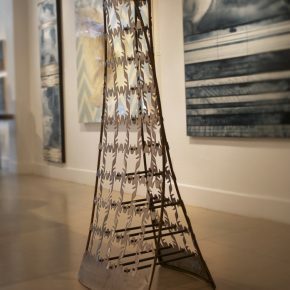 The artist’s “Perforated Object” in Reno inspired Norman to create related works, using the scraps from the manufacture of ice-climbing equipment. 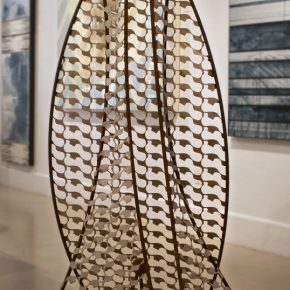 At Gallery MAR, his “Perforated Sail I & II” are made from panels that are what is left over after parts to crampons, ice screws and pitons have been cut out of the original sheet. 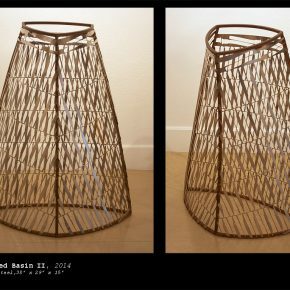 These and other works in the series have a simple grace about them, combining the curves of Brancusi with the positive-negative forms of a Ruth Asawa. Working with this particular type of recycled material led, Norman says, to some academic questions. “For example, how many holes can you put into it and still feel like there is a surface there? How much can you bend it and still call it a ‘suface’? Do the planes of a basin have to even meet for it to be interpreted as a enclosed object?” The formal concerns, he says, are a nice break from some of the political subjects that have engaged him in the past. Norman recently moved to Loveland, Colo., drawn by the growing sculpture community in the town north of Denver that hosts huge sculpture festivals and boasts two bronze foundries, and where Artspace (the national rather than the Utah organization) will develop an entire city block, including 30 studios for artists. 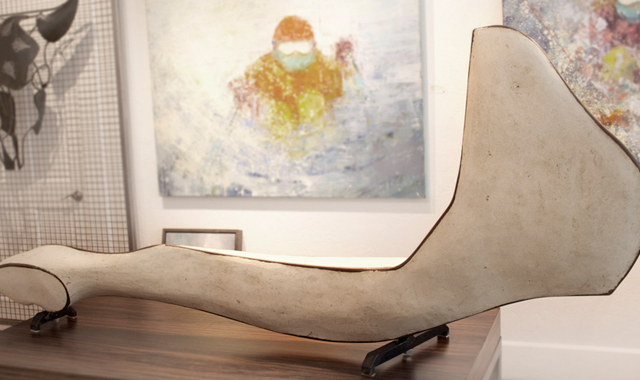 The final group of works on exhibit in Park City is a series of abstractions based on animal bones and skulls. Borrowing techniques from custom hot-rod designers he reimagines the carcasses that festoon the western landscape: a jawbone, a massive hip bone and the ubiquitous bison skull are on exhibit at Gallery MAR. Our local art community may miss having Norman as one of their own, but this current exhibit suggests the move to Colorado has been good for the artist’s creative energies. Bountiful World, featuring the sculpture of Joe Norman and the encaustic paintings of Bridgette Meinhold is at Gallery MAR in Park City through December 15.